European government bonds have scope to recoup some of their losses next week, with inflation data forecast to confirm that the central bank’s monetary stimulus has yet to translate into the real economy. 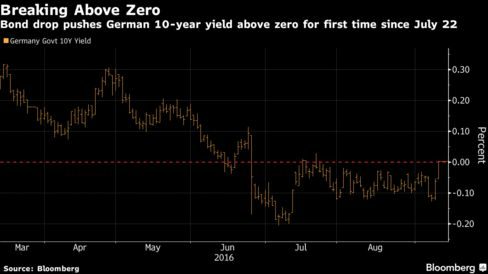 German 10-year bunds fell for a second week, pushing yields above zero for the first time since July, after ECB President Mario Draghi Thursday signaled no expansion to the central bank’s asset-purchase program, or quantitative easing. That sparked a selloff across the region’s government-debt market, where yields on $3.3 trillion of securities that comprise the Bloomberg Eurozone Sovereign Bond Index are currently negative. That’s more than 50 percent of the total. Consumer prices in the euro area rose 0.2 percent in August from a year ago, according to the median forecast of analysts in a Bloomberg survey. That’s in line with an advance reading released on Aug. 31. Inflation has stayed below 2 percent since February 2013; the ECB’s goal is close to, but below, that level. Germany’s 10-year bund yields rose five basis points, or 0.05 percentage point, this week to 0.01 percent as of the 5 p.m. close in London Friday. The zero percent security due in August 2026 fell 0.526, or 5.26 euros per 1,000-euro ($1,121) face amount, to 99.902. The yield touched 0.02 percent, the highest since July 21. The yield on the nation’s 30-year securities climbed to 0.61 percent, having reached 0.62 percent, the highest since June 24. Government securities around the world due in 10 years or more returned 22 percent this year, according to the Bloomberg Global Developed Sovereign Bond Index, while those maturing in one to three years added 6 percent. Still traders’ outlook for price growth remains weak, a potential source of support for fixed-income assets. Germany’s 10-year break-even rate, a market gauge of inflation expectation as measured by the yield difference between bunds and index-linked securities, was at 0.93 percent. While that’s the highest on a closing-price basis since June, it’s still only about half the ECB’s goal.